‘Mind Maps: Stories from Psychology’ exhibition at the Science Museum, London. 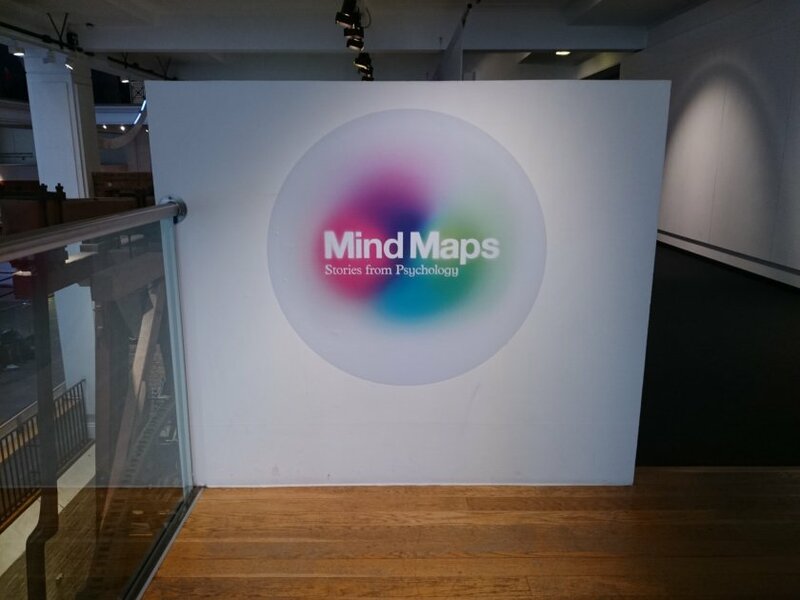 ‘Mind Maps: Stories from Psychology explores how mental health conditions have been diagnosed and treated over the past 250 years. Just to be perverse and begin at the beginning, this write-up of Mind Maps: Stories from Psychology proposes to first consider solely the title of the Science Museum’s current attempt to bring the public up to speed on the sciences of the brain and mind (‘brain’ and ‘mind’ seeming to be more or less equivalent in the exhibitors’ ontological assumptions). This is because the name of the game here is slightly misleading, and for more than one reason. First, to ‘maps’, of which I found none in the exhibition itself, mind-related or otherwise. Though the area set aside for Mind Maps is indeed sorted into helpfully colour-coded sections which chop up the last 234 years into manageable chunks (e.g. ‘From spirits to nerves, 1780–1810’, ‘Nervous exhaustion, 1880–1920’, etc. ), these are not laid out any in any obviously logical way – and ironically, there is no map to help navigate them. Additionally, the blurb from the Science Museum website (see link below) claims there are ‘four episodes’ from history covered, while another page on the same site (via the ‘inside the exhibition’ link) says the ‘exhibition traces five significant moments’, and just to compound this confusion, I think I actually counted six sections, if the final ‘Into the future’ part is considered. Second, another claim of the exhibition is that ‘these are not only stories about scientists and doctors, but also about their patients and the general public.’ This is certainly an admirable aim which sadly bears little resemblance to the reality of what is displayed, failing its billing in two ways – though the oft-overlooked perspectives of patients and public make commendable appearances, the focus is still largely on ‘great men’ and their ostensible breakthroughs, and even then, what are being presented are not really ‘stories’ but somewhat superficial anecdotes attached to a number of historical, material artefacts. So, once the ‘maps’ and ‘stories’ in the title are dispensed with, we are left with something more like ‘Mind Materials: Vignettes from Psychology (and Related Sciences)’. Not as snappy I’ll admit, but it allows us to assess what is on display in a more honest and less hyperbolically expectant way. And in this light, the exhibition stands up far better. Although as mentioned it’s not immediately clear where to start or how to follow the exhibits round Mind Maps, it is nevertheless a fascinating and stimulating collection which is rich enough to render other considerations moot. A looped video welcome from television journalist Samira Ahmed soon gives way to scattered display cases both large and small, some containing extremely striking objects. A huge early commercial Positron Emission Tomography (PET) scanner and its wealth of appended computer miscellany sit just next to the grotesquely eye-catching and complete dissected nervous system of a man, varnished directly onto a wooden board for teaching purposes in the late 17th century: in this juxtaposition of exhibits from either pole of the time-range covered, we see two very different ways of trying to get access to the interior workings of the nervous system. 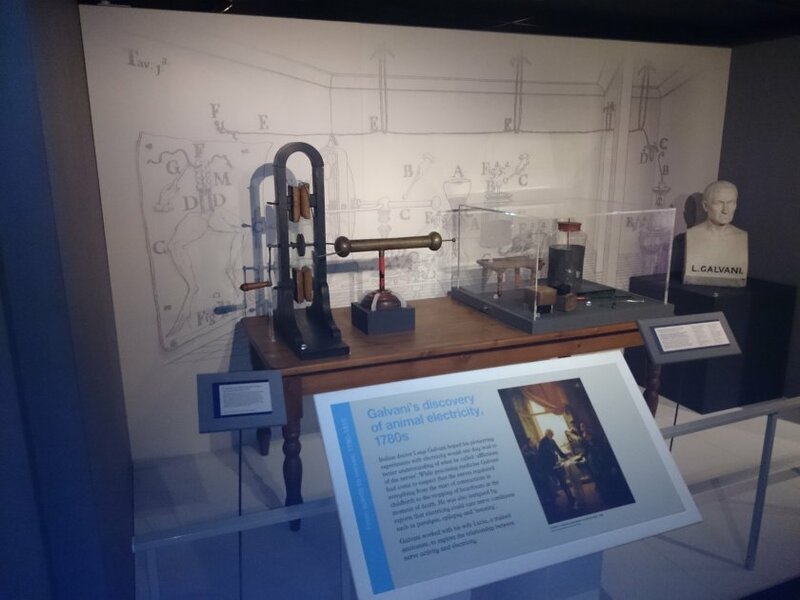 A display of Galvani’s scientific apparatus at the ‘Mind Maps: Stories from Psychology’ exhibition at the Science Museum, London. Further on, key figures in the history of what are now called neurology and psychology are considered, not simply through their no doubt considerable intellectual contributions to knowledge production, but more via their materials, tools, inventions and practices. Thus we see Galvani’s Leyden jars for storing electricity, von Helmholtz’s early psychometric testing equipment, and even du Bois-Reymond’s fantastically named ‘Frog Pistol’ – does it even matter what this was for? I’m just glad it exists. Chronologically later, as mind (or soul) and brain become ever more conflated, the line between artistic, scientific and technological objects grows appropriately blurrier, with Sherrington’s teaching model of a cat situated opposite a bizarre but beautiful little sketch of Freud by Dalí; or a cartoon self-portrait by a patient alongside their doctor at the Burden Neurological Institute in Bristol, this right next to devices used in the process of leucotomies from that same psychosurgically pioneering UK institution. After a section on more recent developments in pharmacology, self-help and the continued but updated uses of electroencephalography (EEG), the exhibition ends (at least it did for me) with what purports to be its only ‘map’ – a large image taken from the Human Connectome Project, and perhaps the real reason the exhibition is titled the way it is. This picture, one of many captured for the project via Magnetic Resonance Imaging (MRI), is supposed to represent ‘the nerve pathways that connect different parts of the brain’ – but to me, though very pretty, it looks less like a map and more like a totally ruined slinky. Whilst highly intriguing, the explanatory power of such images is questionable to say the least when taken away from its background context, the very history of visualising the interior of brains and nerves – not to mention minds – so amply highlighted by the entire exhibition itself. I hope that for most people this one undoubtedly arresting image at Mind Maps’ (possible) end-point isn’t the sole one taken away as its most interesting, never mind its most important. Mind Maps: Stories from Psychology isrunning from 10 December 2013 – 26 october 2014 at the Science Museum, London. Admission to the exhibition is free.